Felice Original: Whoo hoo My first blog award!!! Whoo hoo My first blog award!!! I got my first blog award hiii haaa. I'm so happy,I'm doing the happy dance here. Everybody here at my home is looking funny now hahaha lol. Krissy of Krissy's Scraps gave it to me.Thank honey this meens so much to me! 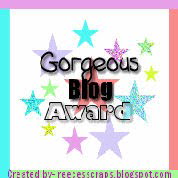 The Rules for This Award are Simple ~ Put the Name and Link of the Person who Gave You this Award on your Blog and Pass it on to 5 Blogs that You think are Absolutely Gorgeous and Awesome! Enjoy girls you all deserve it!!! !